As we remain reeling from tragedy after tragedy it has sent most blogs and social networking sites exploding with reactionary fervor as pundits and people make claims about the obvious need for gun control. This usually recalls several reactions from the right, and libertarian left for that matter, usually ranging from “don’t politicized this”(which is an inherently political response) to “if more law abiding citizens owned guns then this would eliminate the issue.” No matter what the content of these argument, they usually revert to embarrassing claims about the 2nd amendment. Since our constitution protects the right to “bear arms,” this should trump all other attempts at restriction. If the State were to restrict gun rights, even because of some type of populism, this is an act at disarming the populous and will usher in some type of various authoritarianism(the exact type of authoritarianism is usually determined by exactly which delusion and conspiracy theory they prefer). The debate over gun control is not one I intend on getting into as both sides should be labeled culpable for the social inequality from which crime persists, but it does seem to reflect a new kind of “bottom line” argument that is forming. The reliance on the 2nd Amendment argument is not relegated only to this debate, but this reduction to the Constitution seems to be a common choice when confronting common social issues and red herrings. Recently Occupy often rested many of their arguments against expulsion on the fact that the 1st Amendment defended their right for Freedom of Speech and Freedom of Assembly, and this should trump city ordinances like park hours and regulation. This has similarly been used by the Tea Party, mainly to incorrectly cite the 1st Amendment to as a defense neo-Fascist reactionary racism, homophobia, and anti-women misogyny in their dialogue.. The question here is not whether or not the Amendments can be declared to defend these situations, but why. The obvious is usually that these are easy, commonly understood legal provisions that do not require you to pass the bar to cite clearly. But this does not mean that they are the most apt to declare for any of these topical issues, at least in the judicial sense. There are thousands of laws and cases to cite that are more appropriate and specific than the Amendments, yet they are still on call as legal arguments to defend large scale movements and social controversies. It is in this context that I was brought to the attention of a common legal argument around homeless commitments that follows in the same suit. As part of his support for the Occupy Oakland movement towards occupying empty homes, squatting activist posted a blog discussing the basic legal issues that people may encounter when defending their taken residence. (Note: This blog was also placed in its entirety in Hannah Dobb book Nine-Tenths of the Law: Property and Resistance in the United State). This decision seems completely logical to most people when read in this context, but difficult when placed in a legal context. First, deprivation of shelter and food would be considered cruel and unusual punishment. Yet, if this was taken at face value, all under income and homeless people would then have the right to file a class action lawsuit against a State and system of order that deprives them of these conditions. Second, these legal decisions are determined by the judge ruling on the case, and it is often outside of their legal framework to make a determination like this. So what was the determined decision in Miami? They stated that first there must be at least two locations where homeless people could operate for their basic needs without interference, and police are prevented from destroying the property of homeless people. Beyond these there are minor provisions about the period of time people must be notified before a park is cleared out. While there is no reason to downplay the significance of this decision for the homeless people it affects, we should not put it to a level of importance that it doesn’t deserve This decision does not radically change the way that homeless people are treated in that, or any other, city. There are still strong limits on where they can be, what they can do, and it provides no new resources. More than that, they still lack any autonomy in this decision since they have to appeal to the tight restrictions set by the State so that they can meet their most basic needs. There is still and adversarial relationship between the homeless population and the police based on property laws. Citing the 8th Amendment and “winning” did not radically transform anything, and the Constitution did not finally eradicate the inequality and injustice that had been fermenting in Florida. More than this, citing Constitutional Law is a good way of appearing amateurish and irrelevant to most Judges. As DeCaprio points out, there was not even a wide spread decimation of the legal opinion in respected journals or sources. The reality is that Amendments are vague laws that are up to rampant interpretation, and if you think that a radical reading of those Amendments are going to defend you in court you better have a plan B. While it may be good rhetoric, it is not going to be the type of thing that most judges will hear, let alone agree with. This, however, does not mean that a person should entirely abandon this look towards Constitutional Law. Generally, any reading that will benefit a person defending freedom of speech and the protection of people challenging illegitimate property law is useful, even if it often a little less likely. And it still does remain true that winning a case on Constitutional grounds can really benefit people in similar situations, but it is not going to have the kind of systemic effect that people often assume when mentioning the founding documents. The real issue here is not whether or not we can or should cite the Constitution during arguments like these, but why it matters in the first place. The Constitution was written by and for the rich of a new nation, one that was being founded on slavery and indigenous genocide. If the indigenous American peoples had made a claim against displacement based on the 8th Amendment they would have seen the same forces to remove them. At the same time, these Amendments have been “self evident” for quite a long time, and yet have protected very little in the specific issues being argued. The same issues continue to be put into a Constitutional context, and yet they remain just as legally confusing. By citing these we continue a mythology of a pure democracy and equality under this conspiracy of rich people. This, on some level, believes that if we could just remove this secret cabal of bankers from twisting their mustaches then we could get back to the great place America always truly was. By allowing this logic to come through it denies a systemic analysis and approach to the situation, which would say that there are fundamental assumptions about both the State and capitalism that would have to be challenged if we are to actually end homelessness and to ensure that all people have adequate living quarters. The Constitution is not built to challenge these institution because, in many ways, it is the foundation of them. It is designed to exist as a way to prove our nation’s commitment to equality and participation, yet it remains evident how true both of those elements are. If a systemic inequality is to be challenged in the course of direct action, or even activism more generally, you cannot expect to cite the foundation of that inequality as the agent of its destruction. Yes, there is a financial elite that benefits from these laws and the oppression of regular people, yet those are the inheritors of the protections the Constitution promises. Instead of expecting these protections to be “self-evident” the only thing you can expect is for change to come from the collective force of organized people demanding it. This is not something simply written in the constitution, but the logical result when people come together and overturn such a system. It really is fine to continue citing the Constitution as arguments persist if it seems as though it is going to have some benefit, but put it in context. If mentioning the 8th Amendment will guarantee an encampment to maintain itself, then that is a victory worth fighting for. Yet lets continue to actually envision a new world that is not even bound to these documents of the past, which surpasses what is written and exhibits the values that we actually hold. We don’t just want a better protection of our “rights,” which are always up to interpretation by bourgeois courts, but a completely new society and the end to evictions of all sort. The goals of the movement should remain the focus, not the ambiguous idea of protecting the supposed rights bestowed on us by the Constitution. Human rights are inalienable, but they are not guaranteed by the State since that will always be an institution that enforces class inequality as well as the division of the people based on things like race and gender. Rights are guaranteed by a population who believes that they must remain and then fights for them. Next time you hear the Constitution being cited when defending a position you can choose whether or not you want to join in with it or not, but keep in mind that the goal should be movement building rather than believing that you can uncover some type of protection that is not explicitly written. 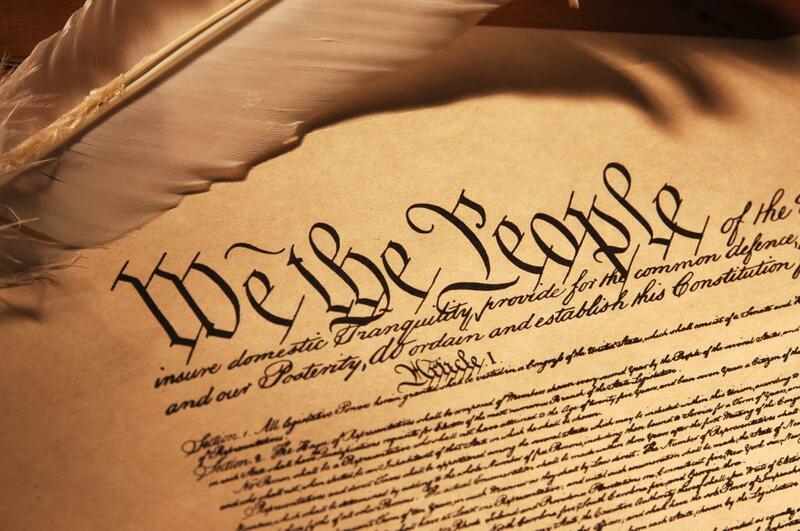 The Constitution does show an attempt at progress from the empires of the past, but it is not the “protecting document” of the masses in the U.S. It is not the final statement in a debate, nor the final answer in a courtroom. 1. DeCaprio, Steve, “Property Laws for Defending Occupation,” BlogSquats, December 28, 2011, blogsquats.blogspot.com. 2. Michael POTTINGER, Peter Carter, Berry Young, Plaintiffs-Appellees, v. CITY OF MIAMI, Defendant-Appellant. Nos. 91-5316, 92-5145. United States Court of Appeals, Eleventh Circuit.